Every medium has its strange little quirks. Odd little rules of the form that have developed and that creators rarely deviate from. For example, it is rare for a movie to have a plot that unfolds in real time. Television shows are limited in length by half-hour increments, allowing, of course, for commercials. You may see a program that’s 15 minutes long, but never 45 minutes. It’s theoretically possible to have a show be 20 minutes long or a movie that is in real time, but it’s rarely if ever done in practice. Comic books are no different. They have their own rules and standards that creators are obliged to follow. One of the most peculiar things about sequential art as a medium is that it is largely devoted to a single genre – superhero action/adventure. There are certainly lots of comics that do not involve capes or tights. But the vast majority of the comics produced in this medium prominently feature superheroes. It wasn’t always this way. In the aftermath of the Second World War, superhero titles began to disappear off the rack. Only Batman, Superman and Wonder Woman survived in any form. Titles like Captain America, Captain Marvel and Green Lantern were replaced by Westerns, Romances and especially horror books. However, as the Silver Age dawned with Showcase #4 and Fantastic Four #1, superheroes came back in to vogue. DC and Marvel plunged into producing cape and tights stories almost whole hog. Even characters that were of other genres like Nick Fury, Jonah Hex, Mille the Model, Patsy Walker and the Two-Gun Kid were folded into their mainstream continuity. Since then, the medium and the genre have been inexorably linked. Sure, there are still some comics that do not feature superheroes, but they are few and far between. It would be like if CBS and NBC’s programming was almost entirely police procedural dramas. All this serves a lengthy preamble to talk about Alan Moore’s America’s Best Comics, an attempt by the famed author to break free from the superhero genre. He introduced books like Top 10, Promethea and Greyshirt that were departures from the usual comic book fare. The most prominent work in the ABC line was Tom Strong, an analog of Doc Savage, Tarzan, Tom Swift and other pulp-styled heroes of the early 20th century. 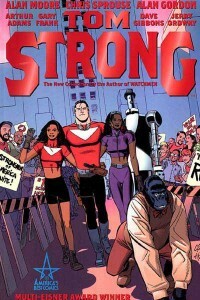 Although still definitely an action-adventure story, Tom Strong is not a crime fighter or vigilante of any sort. His primary interest is science and education. He’s constantly inventing Swiftian devices that, predictably, become useful in his latest adventure. He is a utopianist devoted to improving his world. Of course, Strong is often beset by villains who want to destroy his hometown of Millennium City or kill him to avenge an earlier defeat. Enemies like Nazi air pirate Ingrid Weiss, technological plague the Modular Man and Strong’s arch-nemesis Paul Saveen plague the hero and his family. They’re all fun, off-beat characters that can make you laugh while remaining threatening to the safety of Tom Strong and his extended family. As always, Moore does a fantastic job of developing characters quickly and creating entertaining traps for Strong to unravel, all while maintaining the traditional sense of fun inherent in all pulp fiction. Chris Sprouse's incredible work on Tom Strong. Tom Strong is conceived as Pneuman the Pneumatic Man watches on. Chris Sprouse’s artwork shines. It’s crisp, clean and expressive, while being remarkably detailed where required. He’s a master illustrator who can communicate emotions to his readers in a single, textless panel. It’s some of the best artwork I’ve ever seen in a comic. Sprouse isn’t the only penciler on this series though. Other acclaimed artists like Arthur Adams, Gary Frank, Dave Gibbons and Jerry Ordway lend a hand. Their inclusion in the project was done in a very clever way – they draw all the flashback scenes. 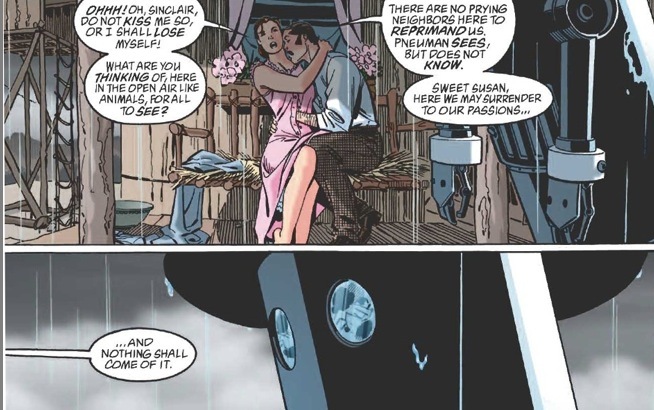 Because these looks into Tom Strong’s past are presented as older issues of the series, the different styles aren’t jarring and, if anything, add to the whole piece. I would recommend Alan Moore’s Tom Strong to anyone who enjoys comics, but especially to those who want a break from the more mainstream and mundane superhero books that clutter shelves at your local shop. He remains one of the few creators in the medium that can shed the cloak of superheroes.